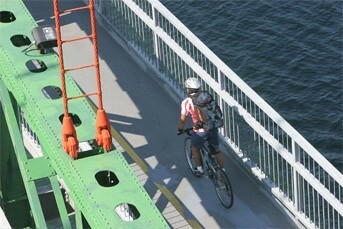 The Macdonald Bridge includes a sidewalk and dedicated bicycle lane to promote active transportation. The sidewalk is located next to the south lane and the bicycle lane is located next to the north lane. Both lanes are open 24 hours/ 7 days a week and free of charge. If the sidewalk and/or bicycle lane is closed, Halifax Harbour Bridges (HHB) offers a complementary shuttle service for pedestrians and cyclists needing to cross the Macdonald Bridge. The shuttle will not be offered if both the Macdonald and Mackay Bridges are closed to all vehicle traffic. If the Macdonald Bridge is closed to all traffic, the shuttle will transport cyclists and pedestrians via the MacKay Bridge. Emergency phones are located along both the sidewalk and the bicycle lane. These connect directly to the HHB operations centre located on the Dartmouth side of the Macdonald Bridge and should be used if you need assistance or if you see someone who may need assistance. The lane on the south side of the bridge is dedicated for pedestrians. People using skateboards or roller blades must carry their roller blades and skateboards and walk across. Cyclists are welcome to use the sidewalk but must walk their bikes. Providing the vehicle on the bike lane has an independent steering and braking system and is not required to be registered under the Motor Vehicle Act (MVA), they are permitted to travel on the bike lane of the Macdonald Bridge. All users must follow the posted speeds. Any vehicle that is required to be registered under the MVA must cross the bridge through using the tolls.